This watering device is automatic, and suitable for seeding and planting When you are on a trip or traveling, this automatic water globe will benefit you greatly. Function: Automatic plant waters / Housekeeper. 1.In order to watering better, put the bottle watering device level below the high end of the green plastic cover. 2. Please note that demand of each plants and pots size, using the appropriate pieces of watering devices. 3. If failure to watering, please repeat the above operation steps to re-use. 4. After months using, need to clean the ceramic piece parts, so as not to affect the effect of continue-using. 5. Make sure there is no air in the spike or the hose before you stick the spike in the soil，or else water won't flow. 6. Make sure the open end of the hose is on the bottom of the jug，or else water will run out too soon. 7. Make sure the spike itself is ABOVE the water line in the jug or else siphon action will quickly dump the water until the spike is above the water line. 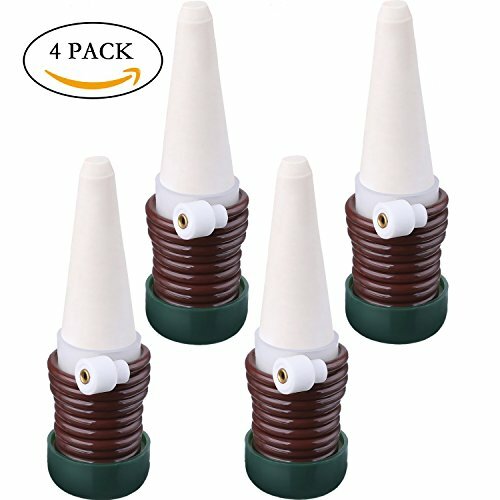 4 x Automatic Plant Waterers. ☛The Self Watering Stakes/Probes Working Principle: According to the siphon principle, as the soil dries, the automatic watering system will draw water into the pot as the plant needs. Get straight to the root with water spikes. And automatically adjust water amount upon soil moisture-the watering stake will cease flowing water once the soil gets moistened enough. ☛All Automatic Sprinkler System: Suitable for seeding, planting, pollution-free. It will now draw water into the pot as the plant needs. Gift Ideas: Great Gifts for family, friends, neighbors and acquaintances or anyone who loves their plants. Also can be used in your Home, Office, Patio or Garden potted plants. ☛One Year Warranty: Purchase the Vacation Plant Waterer with trust and confidence; 1 year warranty and 30 Day Money Back guarantee included by EyreLife. NOTE: After months of using, the ceramic piece parts need to be cleaned so as not to affect the continual use of the water irrigation device. ☛Vocation Essential Helper: the self drip irrigation devices are simple and effective way to water your plants when you are on vacation, business trip or forgetting to water them. Just wet them for a couple of minutes to prepare the tips, then insert the probes into the soil of your potted plants and place the hose ends in a water reservoir nearby. It works automatically-The vacuum created as the water is drawn into the dry soil, then the vacuum can pulls more water in through the supply hose. If you have any questions about this product by EyreLife, contact us by completing and submitting the form below. If you are looking for a specif part number, please include it with your message.